The Natolin nature reserve borders two districts of Warsaw: Ursynów and Wilanów. It covers 105 hectares out of 120 hectares that constitute the Natolin palace and park estate. The protected area is covered with an old growth oak-hornbeam forest, which in some places transitions into a wetland and riparian woodland. Remnants of the vast Masovian primeval forests, flourishing as late as the Middle Ages, have survived in the Natolin reserve. The most valuable stands include, first and foremost, historic oaks, whose age often exceeds 300 years! Moreover, observations and research conducted over many years have confirmed that the Natolin reserve is home to Masovia region’s largest density of occurrence of the middle spotted woodpecker, and a considerable population of the common toad, a protected species. 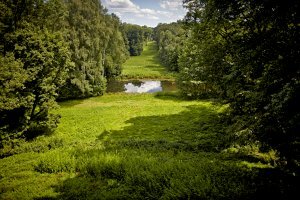 The Natolin nature reserve is situated in the Natolin palace and park estate, which dates back to the 17th century. It was then that the Polish King Jan SOBIESKI III, the ruler of the Polish-Lithuanian Commonwealth, used these remnants of the primeval forest as pheasant hunting grounds. Hence, the initial name of this place was ‘the Pheasantry’ (Bażantarnia). In 1807, the name of the estate was changed to honour the only child of its owners: Natalia POTOCKA. This was the day when, along with the birth of the heiress to a grand Polish family of the Potockis, Natolin was born. The Natolin Palace dates back to 1780, when the then owner of the estate, Prince August CZARTORYSKI, commissioned the architect Szymon Bogumił ZUG to design and build a neoclassical summer residence, with a characteristic semi-open viewing reception room (salon oval) facing east. The ceiling of the room, painted by the renowned Italian artist of that time, Vincenzo BRENNA, has remained untouched to this day. In the early 19th century, the palace was reconstructed according to the design prepared by Piotr AIGNER, another distinguished architect of Polish neo-classicism. Natalia’s grandfather, Count Stanislaw KOSTKA-POTOCKI, had commissioned this work. At the same time, changes were also introduced in the park where, while retaining the existing tree stand, a new spatial arrangement, characteristic of landscape designs in fashion at that time, was put in place. The Natolin palace and park estate gained its final form between 1821 and 1845, under the ownership of Count Aleksander POTOCKI, Natalia’s father. To honour the memory of his prematurely deceased daughter, Count POTOCKI erected a statue, whose form was stylised after ancient Etruscan and Roman sarcophagi. The lost in thought, resting figure of Natalia is the work of a well-known sculptor of the time, Ludwik KAUFMAN. The statue forms part of a broader landscape composition that also includes a Moorish gate straddling the park’s ravine. Another historic structure stands beneath the escarpment: the Doric Temple modelled on the Poseidon Temple in Paestum, an ancient Greek colony located in Southern Italy. The lower part of the park also hosts picturesque artificial ruins, loosely modelled on the Claudius’ aqueduct on Via Appia in Rome. Henryk MARCONI, a distinguished Italian architect who spent most of his life in Congress Poland, designed the historic structures. It is in these magnificent surroundings where the Natolin Campus of the College of Europe is anchored, and where it has thrived for the past 25 years.